All transactions are safe and secure with a reliable history in online purchasing behind each of our associates. 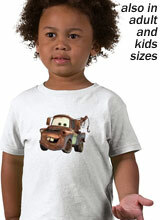 Buy the Tow Mater t-shirt to own Cars clothing and merchandise. The popularity of Pixar's Tow Mater character has not only landed him on the front of Pixar Cars t-shirts like this one, it has also made him the main protagonist in spin-off media such as video games, the Cars Toons series and 2011's Cars 2 Pixar film. Voiced by comedian Larry the Cable Guy, Tow Mater is a rusty old tow truck that was inspired by the 1951 International Harvester tow truck. Yet, other attributes make him more similar to a 1955-57 Chevrolet or GMC. In any case, fans know Mater best as Lightning McQueen's funny sidekick. In addition to the Tow Mater tee above, browse the Cars Clothing Gallery for more apparel like men's and women's clothes, kids shirts or hoodies.